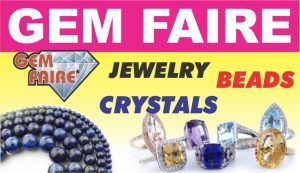 Fine jewelry, precious & semi-precious gemstones, millions of beads, crystals, gold & silver, minerals & much more at manufacturer’s prices. Nearly 200 exhibitors from around the world. Jewelry repair, cleaning & ring sizing while you shop. When: Friday, May 17, noon-6 p.m.; Saturday, May 18, 10 a.m.-6 p.m.; and Sunday, May 19, 10 a.m.-5 p.m.
How much: $7 general admission (admission is good for all three days); children 11 & younger are free. Parking is $9. Getting here: The I-405 Improvement Project is underway. Please be advised that this might impact your trip to OC Fair & Event Center. Get directions and OCTA updates.